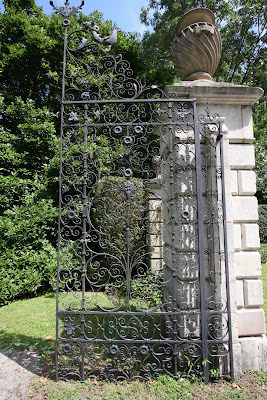 The entrance gates to 'Woodfield', the Robert S. Lovett estate designed by Carrere & Hastings c. 1911 in Lattingtown. Click HERE for more on 'Woodfield'. 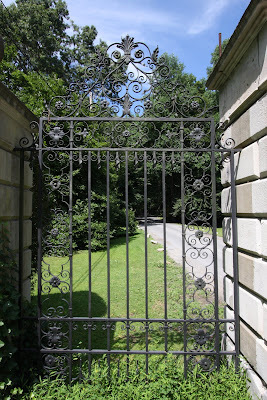 Click HERE to see where these gates are on google earth. The Spinzia book lists Ann Chilton McDonnell Grace Kendell (former wife of Oliver Grace) and Donald McIntosh Kendall as living on Bayville Road in Locust Valley. I was wondering if this gate led to their estate. I love you site! 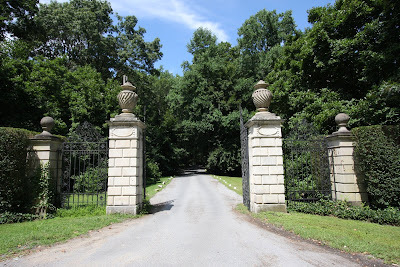 That is the entrance to the old Dieold estate. I dont think anything else is left of it. Subdivided and developed sometime in hte 1950's. Does anyone know where Robert S Lovett last Locust Valley home was that he died in May 1986? I read that 40 Piping Rock Rd was his home but i'm not sure. I thought the Former Lovett home in Locust Valley was on Piping Rock Rd where he died in may 1987? Never knew he own any others?